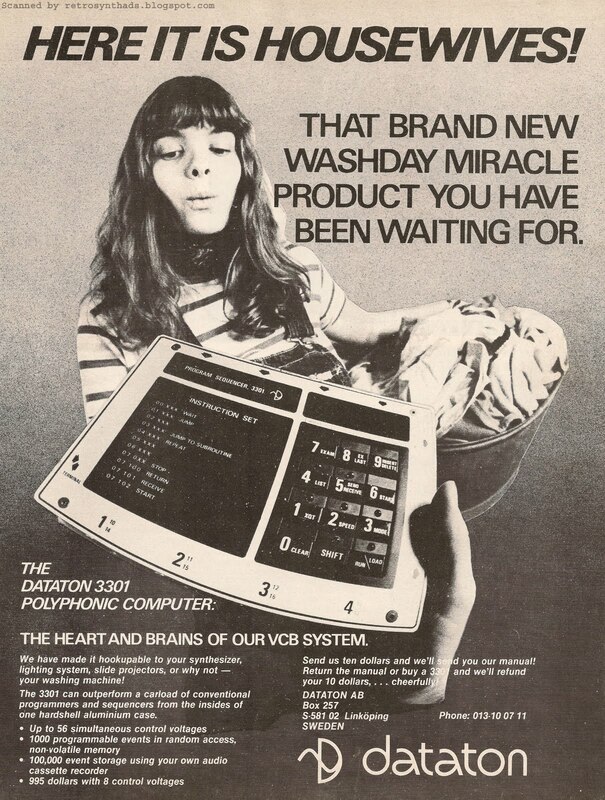 Dataton 3301 Polyphonic Computer from page 5 of Contemporary Keyboard Magazine June 1979. Every couple of years, this stand-out, tongue-and-cheek advertisement and questions about the Swedish company Dataton, makes it's way around the 'net. And each time the topic is brought up, a bit more information about Dataton is revealed. I'm not sure what this cyclic/additive effect is called, but I thought I would try and illustrate this Internet phenomenon by pulling together the information time-line of Dataton into a quick long-weekend post. I'd first heard of Dataton on the Analogue Heaven email list, so it made sense to start my research there. I did a quick search of the archives, and remembered one thing that I keep forgetting: Never start searching the Analogue Heaven archives when you are trying to write a 'quick' blog post. Why? Because you will immediately get lost in all the great reference information as you start digging through all those emails. You will forget that you were actually working on a blog post. The AH archive records do support my often faulty/nutrisweet-impared memory. Dataton was mentioned as early as 1996 in someone's modular manufacturers list. It also shows that this advertisement was being passed around the 'net as early as 2000 and that Dataton was again mentioned again in 2004.
" My info sheet came from Bjorn sandlund in the fall of 1977. Dataon AB was in Linkoping Sweden (sorry about the umlauts etc). 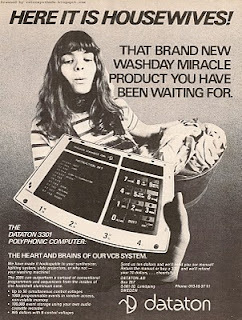 About half the units were available in October 1977 with several units expected in2nd quarter 1978, such as the Quad bus tranceiver and the force sensitive keyboard. Lots of QUAD modules, tactile controllers and a light sensitive element, a module with 2 quad-axis joysticks, and quad universal filter, each with 4 modes per filter), a power amp unit, a digital sequencer unit, lots of links to lighting voltages, ring mod unit, analog electronic cross-coupled reverb unit (3102), octave based graphic equalizer unit, quad enevelope generator that can be patched for use as a tremelo unit or vocoding. The module brochure is 33" x 23" so it wont scan on my scanner, sorry, and it is an odd colour. The modules were in 5x7" aluminum boxes that plug (din) or cable together with connectors on all four sides for most of them. Lots of mixer slide units, so it was sold as an EM studio item, mixer console for film and theatre, and multimedia installations. The unit sat flat on a table, the more modules the bigger the table in the brocure, but stage racks were available, never seen., also XLR rack adapters. The sequencer was $1375CDN or 5.455 Swedish Crowns in Oct. 1977. There were pedal controllers, dissolvers and printer units planned. Datatron AB was copyright 1975 according to the fine print. Sweden's answer to the Synthi and the Wavemaker. Known recordings: ? So, who is this Bjorn Sandlund mentioned in the first sentence of the quote above?
" I happen to know everything about this device and the entire system it belonged to (Dataton System 3000 modular syntesizer and light/projector control system) because I designed it. I also was involved in the design of the ad togehter with a US-native synth guru named Patrick Fitzpatrick. “I know exactly the style they epxpect from an ad over there” he told me and let his girlfriend act as a housewife in their basement on the picture. I outlinied tho photo with a sissor (Photoshop was not available in 1978â€¦) and made the background graident using blach spray color. When I get the time (I’m still the president of the company http://www.dataton.com) I intend to collect all the documents for all the syntesizer modules and make them available on the web, including all manufacturing and design details. Finally, in October 2008, the advertisement made it onto MATRIXSYNTH again, with links back to the Musikmuseet Web site and a new link to the Dataton.com Web site. As I mentioned at the beginning of this blog post, each time the Dataton name is brought up on the 'net, someone comes out of the woodwork with another piece of the Dataton puzzle. Again, I'm not sure what this cycle of regurgitated-yet-additive information is called, but you can clearly see what I'm talking about. End note: A few of you might bring this up, so I thought I better mention it. AWESOME LOGO. Both the D-sinewave logo and t he logo-text font have stood the test of time and are still being used by Dataton. They look as current now as they did in 1979 - good qualities of a great brand identity. Ah, yes, I was the one who posted the scan of the ad above that both CDM and matrix used... I was quite perplexed by the ad when I found it. You just don't see that kind of advertising outside of the likes of Maxim today. But, does it do windows? I really wonder if the ad was effective. I mean, did people read the "Hey Housewives..." headline and go "Whaaaa? I want to read more!" or did they go "Huh?" and just flip the page? And, speaking as a former "housewife", my first reaction is mild offence followed by "Oh, those crazy late-70s Swedes!" If you hadn't qualifed the ad with a country and date, my reaction to it might have been different.